Army National Guard members converged on a parking lot outside ABC Warehouse at 5700 Beckley Road for training and an evaluation of their response to a critical incident. A similar exercise was held earlier this week at C.O. Brown Stadium and and more will be next week again at the stadium and at the former W.K. Kellogg Middle School. 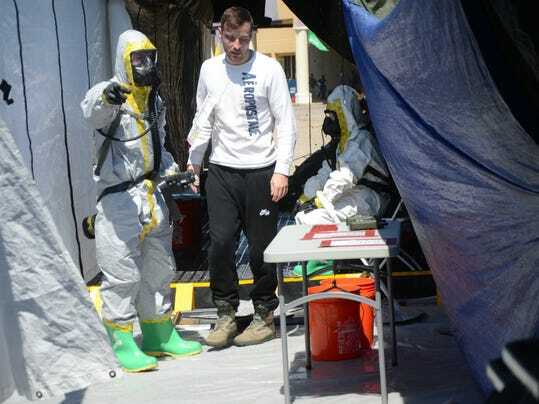 About 160 members of the 460th Chemical Company of the Army National Guard based at Fort Custer Training Center in Augusta participated Friday as well as civilian volunteers who played victims of the incident. The parking lot was filled with military vehicles and decontamination tents as members of the unit dealt with people posing as victims and evaluated the threat posed by a chemical weapon. The military units are trained to respond to chemical, biological, radiological and nuclear incidents, according to the 460th's executive officer, First Lt. Travis Williams of Midland. The exercises this week and next are to determine whether the units are prepared to respond quickly to an incident. He said the operation was set up in 21/2 hours. It was designed to evaluate the incident and begin treating and decontaminating about 40 ambulatory patients and 20 non-ambulatory patients per hour. About 75 to 100 Army personnel, many in special protective suits, would remove the patient's clothing and begin the process of evaluating injuries and decontamination before they are either taken to hospitals or, in the case of uninjured patients, to another location. Williams said the exercise includes establishing the evaluation and decontamination process but also ensuring that all materials used are recorded. "When it's over we know exactly the number of Band-Aids that were used," he said. He said another important factor is to contain all contaminated materials, including liquids, used during the incident. "We want to have a clean footprint," he said. One part of the exercise is to set up an area close to the incident scene and establish the treatment center even when there is not adequate space. Williams said the treatment centers can run around the clock until the work is finished. Lt. Bryce Benda of Fowlerville said some members of the company are trained to evaluate the material used in the attack to determine the proper medical response and also to collect evidence to determine not just what it was, but also help determine who created the incident. Battle Creek Police Chief Jim Blocker said members of the city's fire department and his department's Bomb Squad had some limited exposure to the training. Next week an Army National Guard chemical unit from Alabama will be involved in the training and evaluation.